Andy Warhol. Liz #3 [Early Colored Liz], 1963. The Stefan T. Edlis Collection, Partial and Promised Gift to the Art Institute of Chicago. Last April, Chicago art collectors and philanthropists Stefan Edlis and Gael Neeson made a bigger-than-usual announcement. The husband-and-wife team would be donating some of the choicest artworks in their private collection to the Art Institute of Chicago – an estimated $400 million gift unrivaled by any other in the museum’s 136-year history. The 44 artworks are virtually priceless. 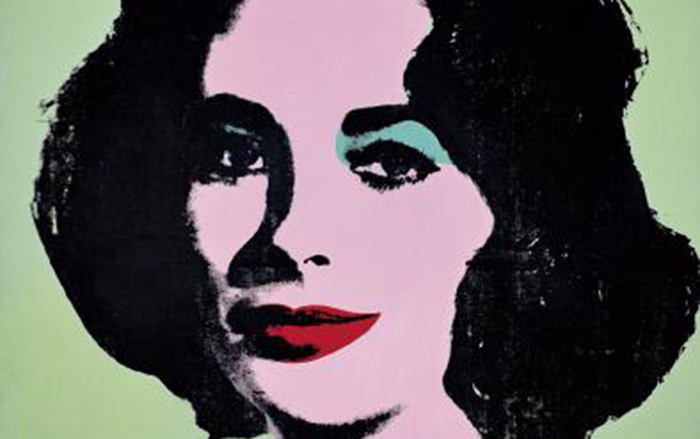 Among them are three paintings from pop artist Jasper Johns, two works from American painter Cy Twombly and nine Warhols – including a painting of Liz Taylor, a piece which will only be exhibited for eight weeks at the Art Institute before going back to the couple’s personal collection for a period. The public will get its first look at those artworks on Sunday, with the opening of “The New Contemporary,” an exhibit within the museum’s Modern Wing, a relatively new addition to the museum which was the subject of a lawsuit within a year of its opening. More on that later. At the time the donation was first announced, Edlis – a self-made businessman who earned a fortune running a successful plastics manufacturing business throughout the latter half of the 20th century – said he’d previously been frustrated by the lack of exposure received by artworks he had donated to other museums in the past. "The fact that the Art Institute proposed keeping the works on permanent view for 50 years was a totally convincing argument for gifting the collection,” the 90-year-old Edlis said at the time. The works must remain together for at least the next 25 years. Neither Edlis nor Neeson currently serves on the Art Institute’s board – over the past three years, the Edlis-Neeson foundation has donated just over $32,000 to the museum, according to the foundation’s tax returns. Over the past decade, the couple has, however, greatly invested in Chicago’s Museum of Contemporary Art. Edlis is currently a vice chair of the MCA’s board and has been a trustee since 1981; Neeson serves on the museum’s exhibition committee. In 2000, the couple made an undisclosed donation to the museum, allowing the MCA to purchase seven artworks the museum currently considers “iconic” to its collection. That same year, Edlis and Neeson made a partial donation to the MCA of Jeff Koons’ “Rabbit,” one of the earlier balloon-style stainless steel sculptures which would later become one of the artist’s hallmarks. More recently, in 2012, the two donated $10 million toward a new MCA theater, which was then named after the couple. With that record of support, how then did the Museum of Contemporary Art miss out on one of the largest donations of contemporary and pop art in Chicago’s history? The answer, according to MCA Chief Curator Michael Darling, is time and space. He’s referring to the fact that, up until Edlis and Neeson’s donation, the Art Institute had actually been hurting in the contemporary art department. Previously, the museum only had one Andy Warhol, a 14-foot-tall painting of Chinese ruler Mao Zedong, part of the artist’s “Mao” series from the early 1970s. Likewise, it had later works from Jasper Johns, but was missing early works. It had early Robert Rauschenberg, but lacked later pieces from the artist. Blake Stimson is a professor of art history at the University of Illinois at Chicago who’s also written a book on Andy Warhol. One of the stipulations of Edlis and Neeson’s massive gift was that the works be displayed throughout the Art Institute for a total of 50 years – with the artworks remaining together in the Modern Wing for the first 25 of those years. Where the Art Institute tends to keep art on display for longer periods of time, according to Darling, the MCA frequently shuffles its collection around and in so doing keeps a larger window open for newer, more experimental artists. But a half-century commitment also has a downside. The collection has to stay together for the first 25 years, which could be a bummer for a curator looking to spice things up – hang a Warhol next to a more recent piece of pop art, for example. Additionally, the deal could potentially cramp the Art Institute’s ability to lend the artworks out to other museums during that 50-year span. James Rondeau, head curator for modern and contemporary art at the museum, said the museum will be able to rotate the works based on conservation needs. For instance, he said, the 12 photographs in the collection from artists Cindy Sherman and Richard Prince will have to be put away for a period at some point due to their exposure to light levels. Rondeau also said that the museum has also been encouraged to loan out the artworks for major exhibitions featuring these artists – in fact, he said the museum already has plans to lend out the sole Rauschenberg painting from the "New Contemporary" collection. According to Stimson, the museum takes a minimal risk with committing to such recognizable, iconic artworks, even for a longer period of time. The Modern Wing itself is a relatively recent addition to the Art Institute – the 264,000-square-foot, $294 million space designed by Pritzker Architecture prize-winner Renzo Piano first opened in 2009. Just a year later, the museum sued the London engineering firm that built it for $10 million in damages, accusing the group of a shoddy construction job, with the suit’s largest claims revolving around an air-conditioning system that couldn’t maintain a safe climate for the artwork, according to federal court documents. More recently, in 2013 the Art Institute closed the Modern Wing for seven months, saying it needed to make cosmetic adjustments on floors, lighting and motion sensors. At the time, the museum said the closure was completely unrelated to the issues identified in the lawsuit, which was ultimately settled out of court in 2011. As to questions of whether the Edlis and Neeson artworks could be in any way compromised by being displayed in the Modern Wing, the Art Institute’s David Thurm said absolutely not. “The New Contemporary” opens Sunday at the Art Institute of Chicago. In conjunction with the opening, Associate Curator of Modern and Contemporary Art Kate Nesin and Museum Education Senior Lecturer Annie Morse will offer a public lecture from 2-3 p.m., free with museum admission. James Rondeau, the Art Institute's head curator of contemporary art, highlights pieces donated to the museum by Chicago art collectors Stefan Edlis and Gael Neeson – an estimated $400 million gift of iconic contemporary artwork. The Art Institute of Chicago announced a historic gift -- 42 works of pop and contemporary art have been given to the museum. We speak with museum President Douglas Druick about this unprecedented windfall of art.